Brooker and Conquest Win at the SugarHouse Casino Friday in Philadelphia! Kings Promotions once again sold out the SugarHouse Casino Friday night for the second straight show. They will be back in a week at the 2300 Arena in South Philadelphia with Carlos Rosario taking on Joshua Davis in the main event. 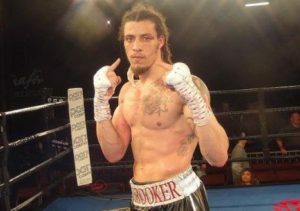 In the main event super middleweight Christopher “Ice” Brooker, 12-3 (5) out of Philadelphia, defeated southpaw Oscar Rojas, 14-8-1 (4), of Monterrey, MEX, in an action packed 8 round bout. In the opening round Brooker was having problems against his second straight southpaw opponent while his trainer was encouraging him to come forward. In a close round Rojas landed more punches. In the second round Brooker drove Rojas into the ropes only to be hit by countering combinations. Brooker finally broke past the jab of Rojas driving him into the ropes with body punches. In the third round Rojas landed a solid lead left to the chin of Brooker who comes back with a left hook of his own knocking Rojas into the ropes which should have been called a knockdown by referee Esteves, Jr. In the fourth round Brooker goes into a crouch and gets caught with a flurry of uppercuts from Rojas. Brooker caught Rojas with a solid left hook to the head out of a clinch. In the fifth round Brooker came forward with a double right to the head of Rojas. Brooker drove Rojas into the ropes but got countered with left uppercuts from Rojas in a round almost to hard to call. In the sixth round Brooker landed several left hooks driving Rojas back several steps. Brooker finally lands a lead right to the chin of Rojas. Brooker was much busier as Rojas slowed down. In the seventh round Brooker drove Rojas into the ropes with a flurry of punches. Both fighters knocked heads causing a lapse in the action. A right hook by Brooker to the head of Rojas almost scored a knockdown. In the eighth and final round a counter left hook by Brooker to the chin of Rojas got his attention. Rojas drove Brooker into his corner with a double left hook. At the bell Brooker landed a solid right to the chin of Rojas. Judges Poturaj, Jasper and Rubenstein all had it 78-74 while this writer had it the same at 78-74. In the co-feature opening round with Perales coming forward Conquest landed a good combination to the head of Perales. Conquest kept the jab in the face of Perales allowing him to get any offense going. In the second round Conquest counters Perales with combinations to the head. A solid right-hook from Conquest knocked the head of Perales back. The hand speed of Conquest is keeping Perales on the defense. A 3-punch combination by Conquest had Perales head spinning. In the third round Perales finally lands a lead right to the chin of southpaw Conquest. At the bell Conquest from the corner landed a solid left to the head of Perales. In the fourth round Conquest landed a left uppercut knocking Perales off balance. Perales landed a solid left hook to the head of Conquest who countered with a left to the head. Conquest continued to beat Perales to the punch. In the fifth round Perales knowing he was behind starts throwing punches in bunches until a left to the head from Conquest stops him in his tracks. Perales started showing his frustration as Conquest is landing punches in bunches right up to the bell. In the sixth and final round Conquest is catching Perales coming forward in desperation but getting hit in the head. Peales lands a flurry of punches backing Conquest into the ropes bringing a smile to the face of Conquest. It was Conquest the rest of the round dealing out punches to the head of Perales. Judges Poturaj and Gradowski 60-54 and Rubenstein 59-55 while this writer had it 60-54. Coram, NY, over 6 rounds. In the opening round the much taller Beckford used a solid jab keeping Mansfield at bay before coming in under the jab with some uppercuts to the chin of Beckford. A lead right to the chin by Mansfield rocked Beckford at the bell. In the second round Beckford’s jab is keeping Mansfield looking for an opening landing several uppercuts when he gets inside. Beckford’s been warned several times by referee Esteves, Jr., for leaning on top of Mansfield and using his forearm to the head. In the third round another warning to Beckford for holding behind the head and hitting by referee Esteves, Jr. Once again Beckford uses the foreman to the throat of Mansfield and gets away with it. A lead right by Mansfield to the chin of Beckford had him holding on. Mansfield had a welt under his right eye by the end of the round. In the fourth round several uppercuts to the chin by Mansfield had Beckford holding on. Beckford landed an overhand left to the head of Mansfield then Beckford fell backwards barely staying on his feet. Mansfield turned southpaw landing several right hooks to the head of Beckford who looks like he is out of gas by continuing to grab Mansfield into a clinch. In the fifth round Mansfield lands an overhand right to the head of Beckford who had his right hand caught on a rope strap. Beckford was losing his trunks as referee Esteves again pulled them up. In the sixth and final round Mansfield continued to come forward knocking the trunks of a holding Beckford. Mansfield got inside working uppercuts with both hands to the mid-section of Beckford. Beckford continues to push Mansfield to the ropes while holding him completely out of gas. Mansfield gets in several rights at the bell almost knocking Beckford off his feet. Judges Poturaj 57-57, Gradowski and Jasper had it 58-56 while this writer had it 57-57. 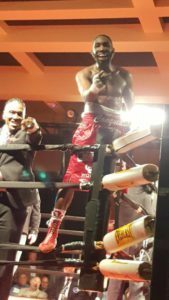 Cruiserweight southpaw Sam Orapeza, 2-0 (1), of Philadelphia, scored a pair of knockdowns in a wild brawl defeating Kyle McNutt, 1-3 (1), of Battle Creek, MI, who had Orapeza out on his feet at the final bell in a 4 round bout. In the opening round McNutt came out using his jab as Orapeza was throwing leather to the body an ending it with a solid left to the head of McNutt. A lead straight left by Orapeza to the chin of McNutt and down he went taking the count of referee Bashir. A lead left by Orapeza to the head of McNutt drove him into the ropes. In the second round both fighters exchanged shots to the head. Orapeza was landing lead lefts to the head with McNutt covering up. McNutt came back with a good body attack. A lead left by Orapeza to the chin of McNutt rocked him. McNutt landed several uppercuts making Orapeza fall into him. Then McNutt ended the round with three left hooks to the head of Orapeza. In the third round McNutt used his jab well while Orapeza may be tiring. Orapeza came back driving McNutt into the ropes but McNutt countered Orapeza back blooding his nose. Orapeza with his many backers screaming for him started throwing punches in bunches. In the fourth and final round a lead right by McNutt landed well on the chin of Orapeza who came back landing an overhand left on the chin of McNutt dropping him to the canvas. Referee Bashir gave him the 8 count. Both fighters landed solid punches as McNutt had Orapeza out on his feet at the bell. Judges Jasper 38-37, Gradowski 39-35 and Rubenstein 39-36 with this writer having it 39-36. Super lightweight Jeffrey Torres, 3-0 (1), of Philadelphia, defeated southpaw Kashon Hutchinson, 2-3 (1), of Reading, PA, over 4 rounds. In the opening round Hutchinson used a jab to keep Torres at bay. Hutchinson landed a left uppercut to the mid-section of Torres whose defense is wide open with hands to his side. In the second round Torres landed a left hook to the chin of Hutchinson knocking him back several steps. Torres pinned Hutchinson against the ropes getting half a dozen punches in before Hutchinson spun out. A solid left hook by Torres at the ten second mark was followed by another seconds later knocking the mouthpiece out of Hutchinson. In the third round both boxers were exchanging head shots forgetting the body blows. Hutchinson landed a 3-punch combination with no return from Torres. A counter left hook by Torres rocked Hutchinson. In the fourth and final round Hutchinson started using his jab as he did in the first round but Torres was countering with lead rights to the head. Torres can’t miss with those lead rights down the pike landing on Hutchinson’s head. Judges Rubenstein and Poturaj 39-37 and Gradowski 40-36 with this writer 39-37. Bantamweight Harold Lopez, 1-0-1 (1), of Allentown, PA, scoring a knockdown had to settle for a draw with Basyzber Baratov, 2-1-2 (0), of Philadelphia, over 4 rounds. In the opening round a counter right to the head from Lopez rocked Baratov. Half a round later it was Baratov with a right to the head rocking Lopez. There was no feeling out in this round. In the second round Baratov rocked Lopez with a combination to the head. In this round there were more wild misses than punches landed. In the third round a Baratov lead right caught Lopez on the side of his head getting his attention. Lopez landed a straight right to the chin of Baratov driving him into the ropes. Baratov came back with a right to the head of Lopez. Then Lopez rocked Baratov into the ropes and shortly after dropped him with another right which was a questionable call by referee Bashir. In the fourth and final round both are swinging for the fences with as many misses as hits. It got very sloppy in there until Lopez rocked Baratov with a right to the chin. Judges Gradowski 39-38 Lopez, Rubenstein and Jasper a 38-38 draw, and this writer 38-37 Lopez. Nelson took the first and was winning the second round when a straight left from Nevarez dropped him just before the bell. Referee Esteves, Jr. counted as the bell sounded and Nelson was up. In round three Nelson came back to take a close round. In the fourth and final round both boxers were trying for the knockout. Elson was landing some haymakers but Nevarez hung in there. Judges Rubenstein, Jasper 38-37 Gradowski 39-37 this writer 38-37. Christopher “Ice” Brooker Headlines at SugarHouse Casino Friday! Kings Promotions with CEO Marshall Kauffman and David Feldman come back looking for another sold out arena Friday night at the SugarHouse Casino in Philadelphia! A press conference was held at the SugarHouse Casino in Philadelphia Tuesday on 1001 N. Delaware Avenue. There will be seven bouts with a total of 38 rounds of competitive boxing. First bout at 7pm. Philadelphia’s ever popular super middleweight Christopher “Ice” Brooker, 11-3 (5), will be in the main event looking to stop a two fight losing streak as he takes on southpaw Oscar Riojas, 14-7-1 (4), from Monterrey, MEX, over 8 rounds. Promoter Kauffman said “no soft fights for the fighter’s only entertaining fights. We sold out the arena in our first show and expect to do it again in our second show here at the SugarHouse Casino come Friday night”. “I made the mistake of trying to box instead of my usual aggressive style in my last fight. There will be none of that this time,” said Brooker. He had a new trainer in his corner last fight named Muhammad Aziz who will be there again. “I didn’t have a big amateur career so every fight is a learning experience for me,” said Brooker. First boxer to speak was Philadelphia’s cruiserweight Sam Orapeza, 1-0 (1), a cruiserweight and former MMA fighter at 13-3 with all knockout wins. “I look to knockout every opponent they put before me,” said Orapeza. He debuted at the SugarHouse Casino March 11th scoring a first round knockout! He will face Kyle McNutt, 1-2 (1), of Battle Creek, MI. Like BrookerOrapeza is all action! The co-feature will be headlined by Lightweight Jerome “The Conqueror” Conquest, 6-2 (1), of Philadelphia who had his trainers Wade and Randy Hinnant there. “I broke my foot but wasn’t diagnosed properly and did my roadwork for 17 weeks before it was discovered broke. I was out for 6 months but it feels fine now,” said Conquest. He is matched with veteran Daniel Perales, 10-9-1 (5), out of Monterrey, Mexico, over 6 rounds. David Feldman let all in attendance know that “Sam, Chris and Jerome didn’t have it easy growing up and it prepared them for the sport of boxing”. Bantamweight Harold Lopez, 1-0 (1), who is out of Allentown and who was on the Puerto Rican Olympic team is backafter scoring a first round knockout on the last show. He faces Sergio Aguilar, 2-5 (2), of Mexico City, Mexico. Anytime a Puerto Rican and Mexican meet it usually means fireworks! From out of state will be Featherweight Chaise Nelson, 4-1 (3), of Dayton, OH, will be in a 6 round bout. He will be in against his sixth straight Latino opponent in Bryan Perez Nevarez, 2-5-1 (1), of Puerto Rico. Also from out of state is lightweight Jeffrey Torres, 2-0 (1), out of CT, who takes on Kashon Hutchinson, 2-2 (1), of Reading. Torres wins were both in Philadelphia. In a 6 rounder is super middleweight Blake Mansfield, 4-0-1 (2), coming in from Burlington, NC, taking on Henry Beckford, 4-6 (1), of Coram, NY. Also on Saturday at the Grundy Arena in Bristol, PA, on 475 Beaver Street will feature southpaw Derrick “Take It to The Bank” Webster, 22-1 (11), out of Glassboro, NJ, who will face southpaw Frankie “The Freight Train” Filippone, 22-5-1 (7), from Norfolk, VA, who is on a 6 fight winning streak for the WBFInternational super middleweight title over 10 rounds! There will be a female bout in the co-feature with super lightweight Tunisian IkramKerwat, 7-1 (5), out of Frankfort, Germany against Atlantic City welterweight Althea “Lady Thunder” Saunders, 3-3-2 (0), who is known at times to sing the National Anthem. It will be for the WBF Junior Regional title over 6 rounds. On the undercard will be Trenton’s Mike Hilton, 5-0, Camden’s Vidal Rivera, 5-0, New York’s MikkelLesPierre, 15-0-1, Asbury Park’sDarryl Bunting, 3-1-2, and Pensacola’s Frederick Wilhite, 5-0. New to the area will be promoters Deuce Promotions, Mis Downing Promotions and K5 Promotions per Marc Abrams who is the PR man for both shows.